Two influential U.S. business groups have issued a report detailing how China is moving ahead with a technology policy set to be a key point of contention in the U.S.-China trade talks that resume in Washington. In a joint report to the U.S. Trade Representative, the U.S. Chamber of Commerce and the American Chamber of Commerce in China say Beijing’s ambitious plan to become a global technology leader is being widely implemented, casting doubt on efforts by Chinese officials to play down its significance. There is evidence of “a deep, concerted and continuing effort” by provincial officials to pursue the central government’s Made in China 2025 plan, which seeks to make China a leader in electric vehicles, aerospace, robotics and other frontiers of manufacturing, the two business groups say. The report comes as negotiators for the U.S. and China prepare to continue trade talks in Washington Jan. 30. The chambers wield clout with the White House as representatives of American companies doing business in China, many of whom are reluctant to criticize Beijing publicly. The business associations also have influence among China’s leaders as longtime advocates of closer U.S.-China business ties. To that audience, their report reinforces a message U.S. business leaders have been trying to convey to Beijing: China can no longer take U.S. business-group support for granted. The USTR’s investigation into Chinese trade practices last year concluded that Made in China 2025 created an unfair playing field for American companies, including by making their trade secrets vulnerable to Chinese competitors. But Beijing negotiators also say the U.S. has exaggerated the significance of Made in China. Vice Premier Liu He, Beijing’s top trade envoy to the U.S., has played down the importance of the plan in meetings with U.S. business groups, participants say. The chambers’ report was delivered last week to USTR and obtained by The Wall Street Journal. It advocates structural reforms to further open Chinese markets for foreign companies, including an end to forced transfer of trade secrets. A spokesman for the USTR declined to comment on the report. The USTR’s own March 2018 report, which alleges China has forced U.S. firms to hand over technology to Chinese partners, mentions the Made in China 2025 program 120 times. But it doesn’t show how the program is being putting into effect around the country, a topic the report by the two chambers of commerce examines in detail. The business groups’ 142-page report is silent on one of President Trump’s main goals—reducing the U.S. trade deficit with China—but devotes 32 pages to how the Made in China plan is being rolled out nationwide. 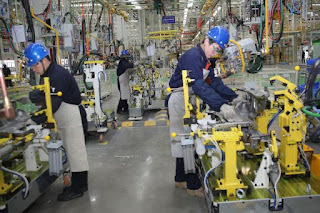 The rust-belt province of Liaoning, meanwhile, has preferential tax policies for advanced manufacturing and for scientific investment, according to the report. The report gives U.S. negotiators more evidence to press for changes during talks with the Chinese delegation, which are to be led by Mr. Liu. The U.S. has suspended until March 1 plans to raise tariffs on $200 billion of Chinese goods to 25% from the current 10%, while the two sides carry on talks. The chambers’ report focuses on the specifics needed to change China’s economy so U.S. companies and compete more fairly, giving ammunition, however to those who worry Mr. Trump will settle for promises by China to buy more U.S. goods and services and largely ignore structural changes. In midlevel negotiations in Beijing earlier this month, about half the time was taken up on prospective purchases, negotiators say. The chambers don’t push—or even mention—additional U.S. exports. “Purchases may be important to this administration, but in terms of [fundamental reform] going forward, purchases are not the answer,” said Jeremie Waterman, head of the U.S. Chamber of Commerce’s China Center. Among other recommendations, the report advocates the creation of a new international arbitration system to resolve complaints by U.S. companies that believe they were mistreated in China. That could be a tough sell to both governments, as the Trump administration has tried to reduce the power of international bodies and China could object to a system that overrules its judiciary.